Here in Eneos Beach Villas we are focused on your service. 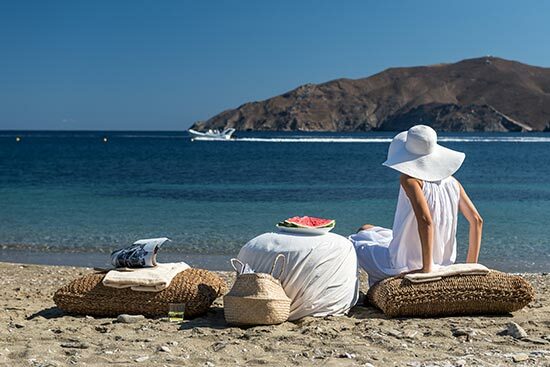 A special selection of our most favorite activities and experiences is chosen by our team, to help you make the very most of your time on your holidays in Kythnos Island. Contact us and let’s start planning your journey with us. We will be happy to tailor the perfect vacation experience for you. For hiking lovers, hiking in Kythnos island is a good choice because of its variety of paths. The island hosts an extensive network of trails that have remained unchanged through the passage of the time. Pass by mountainous sceneries, beaches, old windmills, hidden bays and old castles. Contact us and let’s start planning together your journey. For natural spa lovers, we suggest you to visit the hot springs of Kythnos that are located at the coastal village of Loutra (Baths). There is a hot spring located in the Hydrotherapy Centre, which was founded in the years of King Otto. The second hot spring flows freely towards the sea and the visitor can enjoy it completely free in Loutra Beach. Discover the history of Kythnos through visiting the archeological sites of the island. The ancient capital of the island is Vryokastro at the NE side of the island (inhabited since the 10th c. BC). The archaeological research brought to light the fortified settlement, the ancient port, the sanctuary of Demeter on the top of the Acropolis, public buildings, the necropolis and large quantities of finds from various categories. Maroulas, one of the main archaeological sites in Kythnos, is one the earliest sites to be located in the Aegean Sea (Mesolithic period 8500-6500 BC). Among the finds belong remains of circular constructions, interpreted as residences, storing pits, stone implements and several burials with intact skeletons. 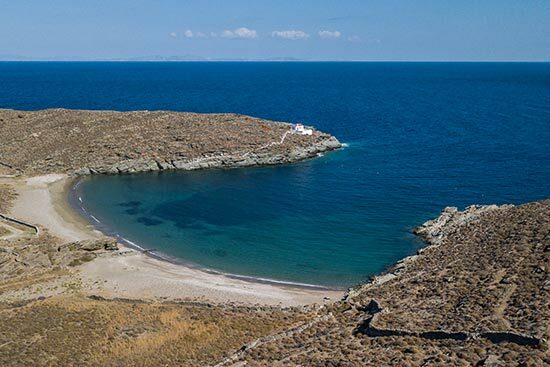 The site is situated along the NE shore of the island, on an eroded peninsula near Loutra and only 2 km away from Agios Sostis beach and Eneos Beach Villas. A very nice walk from Agios Sostis leads to the Byzantine capital of the island the Castle of Oria or Katakefalos at the northern headland with a breathtaking view and amazing scenery. If you like nature, we recommend you visit the Katafyki Cave with beautiful stalactite and stalagmite formations located on the edge of traditional village of Driopida. For culture and tradition lovers, it will be a good choice to attend some performances, discussions, music and dance special events during August thattakes place the Kythnia Festival. Kythnos is only 1.5 hours from Athens and one of the best summer weekend getaways close to Athens. It is a well-preserved island of Cyclades, out of the mass tourist destinations. Quaint whitewashed houses, countless country chapels and impressive cycladic nature sculpt an untouched scenery of mind-blowing, quintessential beauty against the velvet blue of the Aegean Sea. Chora or Messaria, the current capital of the island dated from the 17thcentury, is one of the most elegant and spacious Cycladic towns, that will inspire you with the scenic paved alleyways, small plateaus and stairs arcades. Chora is a unspoilt a Cycladic settlement with whitewashed cube houses and coloured doors and windows. The atmospheric Chora is pedestrianised and well worth exploring. Loutra, the most popular fishing village and summer resort, keeps its natural and traditional identity. Loutra is also a great anchorage, as it is a base station and popular stop over for regattas and island hopping by sail or rib boats. 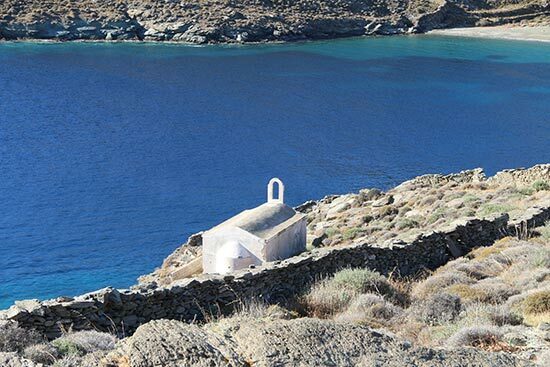 Loutra means baths and Kythnos is the only island of Cyclades with natural thermal springs. 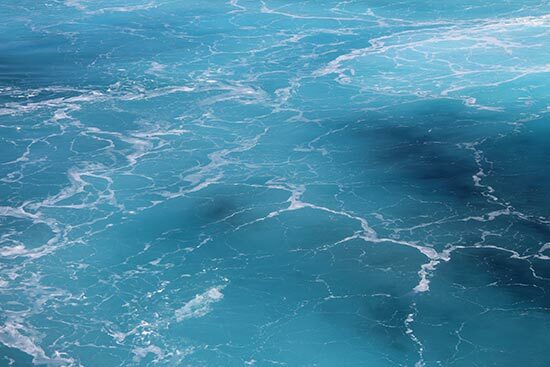 One thermal spring flows into the sea. Sign of the 19th century industrial architecture is an old loading dock for the old mines activity, still intact. Loutra offer due to the seafront fish restaurants and taverns, cafes and bars a lively life during day and night. Dryopida, located in a sheltered location, stands out for its unique architectural style with two storey houses with tile roofs. Merichas is the main port of Kythnos with seafront restaurants and cafes. 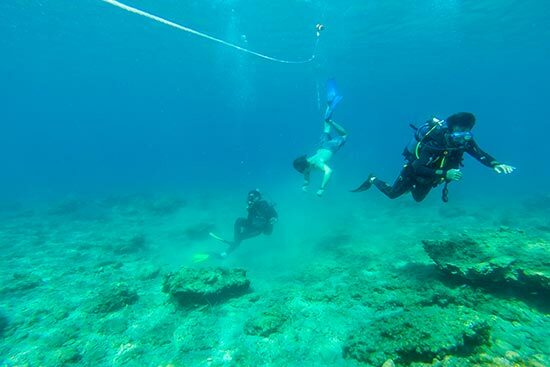 For diving enthusiasts, the best and the most important dive site of the island is the area of Agios Sostis with at least 7 different dive sites. One of them is the impressive “Abyss” with a vertical wall to 85m. depth, full of abundant colours, sponges, corals, plants and submarine life that are impossible to describe. The famous and exquisite double bay of Kolona is a thin strip of sand leading to the offshore islet of Agios Loukas. Kythnos has over 90 beaches. You can find any type of beach you are looking for, sandy, pebble, family friendly, secluded, relaxing, remote or organized. Start your privet day trip directly from Eneos Beach Villas. Agios Sostis is a great starting point for rib boat trips. 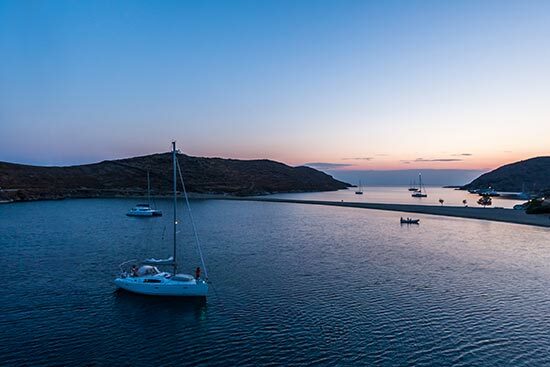 Explore the north part of Kythnos and anchor in Kolona bay for swimming and relaxing beach time. Approach the east side of Kythnos and enjoy swimming in numerous beaches and inlets. 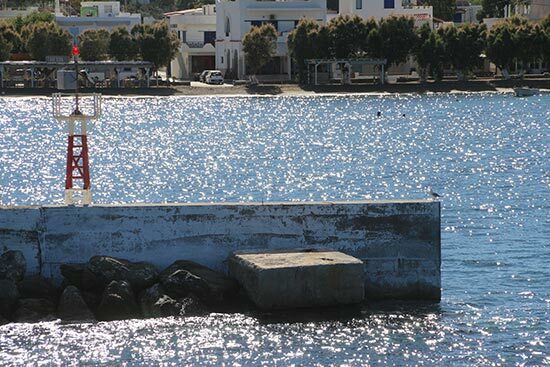 Moor at seafront villages like Panagia Kanala and enjoy seafood in taverns by the sea. Discover the archeological site of Karthaia in Kea (Tzia) and relax on the beautiful beach. Karthaia is only 8.4 nautical miles away from Agios Sostis.